Aaaaaand they are away. I am of course referring to that jockey’s trousers. Normally you have to worry about your horse rearing, not your own rear end. 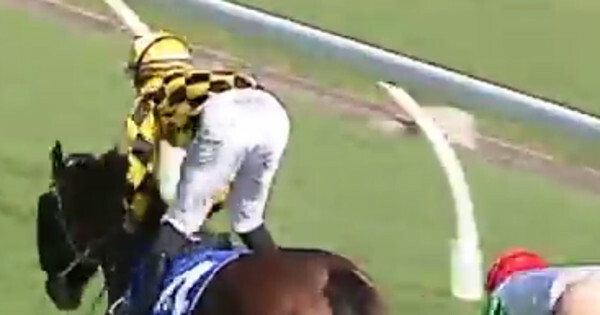 During a race yesterday in Canterbury, Australia, jockey Blake Shinn riding atop Miss Royale managed to come in second, while his trousers managed to come in last and nowhere near on top. Sure, it is embarrassing to have your trousers fall down, with your tail hanging out, but it is even more humiliating to all the jockeys who came in behind his, well, behind. According to the jockey himself, his velcro came reversed, which is why viewers could see a full moon at the center of the day. Was name Modesty, demonstrating the Universe does have a sick sense of humor. Blake looks like a great sport about it, and is using the literal exposure to auction the trousers off to raise capital for the National Jockeys Trust & Prostate Cancer Foundation of Australia.